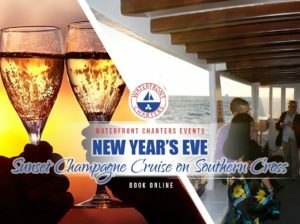 Waterfront Charters know exactly how to make V&A Waterfront New Year’s Eve celebrations wonderfully memorable; our two Special Cruises are designed to make a special night perfect. Silvester, Réveillon, Calennig, Kanun Novogo Goda: they all mean the same thing. It is probably a giveaway to add Hogmanay - yes, they are all names for the day we know as New Year’s Eve. Silvester is the most common, and listing all the places that recognise the day would fill this blog. Amongst others are Austria, Croatia, Germany, Italy and Israel. Réveillon is celebrated in France (but you guessed that), Algeria, Brazil, Portugal and French North American locations. Calennig is Welsh, and Kanun Novogo Goda very obviously Russian. Jings and och aye, if you didn’t recognise Hogmanay as Scots, ye’ve no lived at a’! Like the rest of the world, here in Cape Town New Year’s Eve is a time for celebration, letting one’s hair down and partying until dawn. The V&A Waterfront has become the central attraction for revellers, and a combination of unique events, great restaurants, phenomenal attractions and a midnight fireworks display make New Year’s Eve at the V&A a spectacularly memorable occasion. 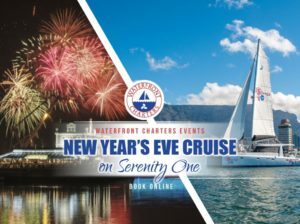 Waterfront Charters have been offering special cruises at the V&A for 28 New Year’s Eves: we know exactly what makes the night so special, and we know exactly how to enhance the experience to make it perfect. 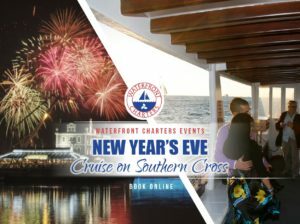 Our two 2018 special New Year’s Eve cruises are the perfect way to ring out the old and ring in the new. Carefully arranged to suit your plans for the evening, you can choose between two great options aboard our sturdy Southern Cross – the perfect vessel for viewing events. 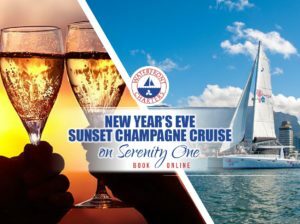 The Champagne Sunset Cruise departs the V&A Waterfront when the sun is settling in the west; we cruise the swells of Table Bay, and then raise our champagne flutes to salute the last sunset of the year. Once the daylight has faded and Cape Town’s twinkling lights dot the horizon, we’ll take you back to the V&A, and you can then eat, drink and be merry wherever you choose. The Midnight Special is set up to celebrate the actual change of year: once again the Southern Cross will set out from the V&A around late evening, and this time we will arrange it so that guests have the perfect vantage point at midnight. As Auld Lang Syne (direct translation: Old Long Since) rings out, and the fireworks explode in a pyrotechnic greeting, you’ll have the most comfortable viewing platform in the city. Perfect views with like-minded companions; champagne and a well-stocked bar. There is only one catch: both cruises are limited to 60 guests, so if you are looking for the perfect Hogmanay platform, we suggest you book early before the boat fills up. Online booking will ensure that your New Year’s Eve celebrations are something to really look forward to. ¡Feliz Año Nuevo! ; Kiortame pivdluaritlo! ; Sretna Nova godina! ; Bonne annee! ; Bliain nua fe mhaise dhuit! ; Felice anno nuovo! ; Prosit Neujahr! Blwyddyn Newydd Dda! Gelukkige nuwe jaar! In other words: Happy New Year!